Bison in Golden Gate Park. In 1891, long before there was an Endangered Species Act, the city, pushed by Park Superintendent John McLaren, set out to save the bison (or buffalo as they are colloquially known). McLaren brought to Golden Gate Park from the plains of Wyoming a majestic exemplar of the species to take its place among the bears, elk, and goats that roamed free in the park at the time. The animal was given the name Ben Harrison after Benjamin Harrison, then president of the United States. Ben was soon joined by a female companion, Sarah Bernhardt, named after the great turn-of-the-century actress. 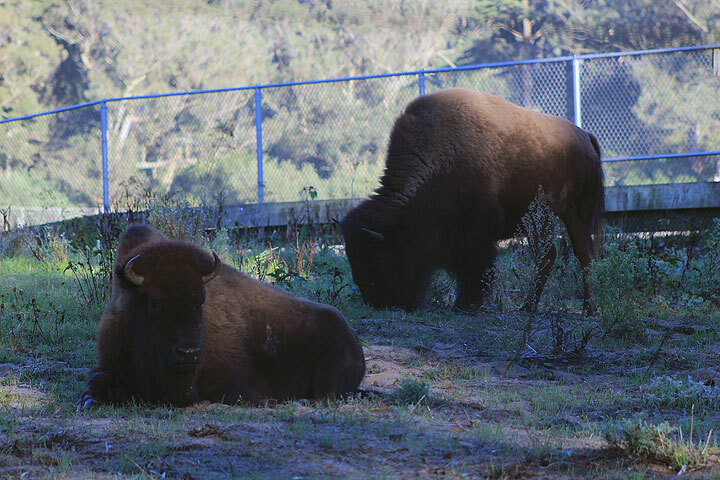 Ben and Sarah soon did what boy and girl bison do, and the San Francisco herd, now located in the park on John F. Kennedy Drive just east of 41st Avenue, was on its way. It was not a moment too soon. 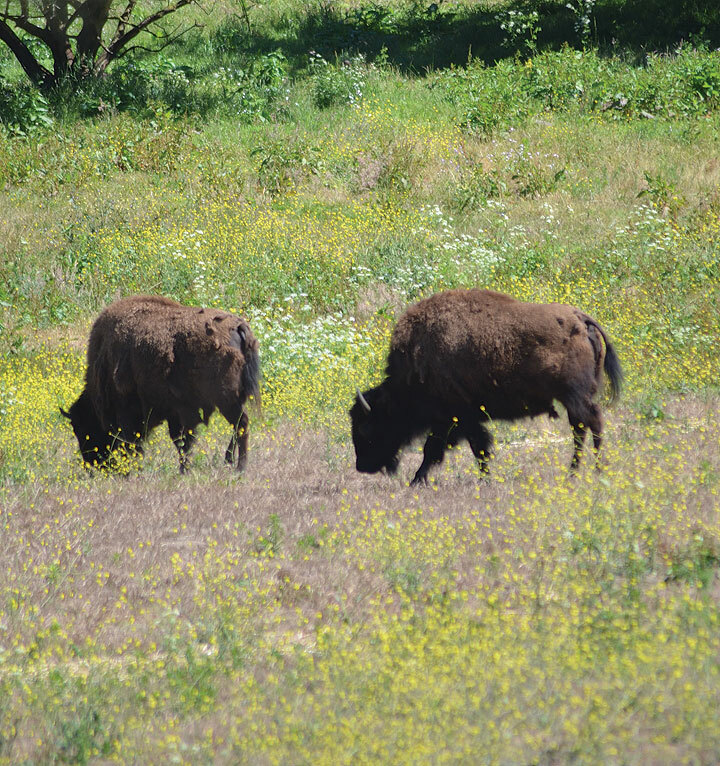 In 1800, 50 million bison populated the American plains. By 1890, there were only 800 left. Slaughtered indiscriminately by white hunters, the beasts were often killed for their tongues, considered a delicacy in the 19th century. The construction of the transcontinental railroad upped the ante. Buffalo Bill, working as a hunter killing bison to feed railway workers, bragged of causing the demise of 4,200 bison in a 17-month period. When the railroad was completed, the trains would often halt when a herd was spotted so passengers could engage in target practice, leaving the carcasses to rot. San Francisco, however, was providing a counterweight to these destructive practices. Ben Harrison was joined by other presidential namesakes such as Grover Cleveland, Bill McKinley, and other buffalo imported from Yellowstone National Park. By 1918, the San Francisco paddock showcased 30 bison. Over the years, the herd has been decimated by disease and death. (A domesticated bison lives about 25 years.) When tuberculosis struck the herd in the 1980s, seven of its members were quarantined at a pasture adjacent to San Francisco’s County Jail in San Bruno, where a coordinated escape attempt failed. More recently a young calf died after running into a fence in an effort to escape an unleashed and pursuing dog. The herd has periodically been replenished, however, by the city and by private donors. For bison in general, things are not nearly as gloomy as they were in 1891. In 1903, the federal government banned the slaughter of these animals. Now more than a century later, 350,000 of this species live (if not exactly roam) in the United States. The herd in Golden Gate Park, which has birthed a good 500 calves, has made a proud contribution to this renaissance. 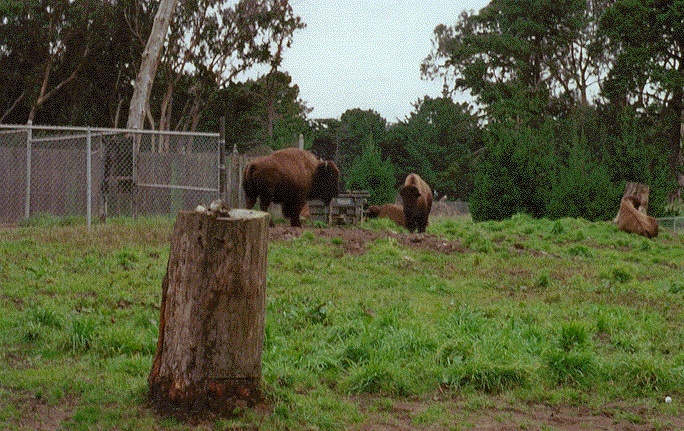 Buffalo have roamed a fenced acre in Golden Gate Park for decades. 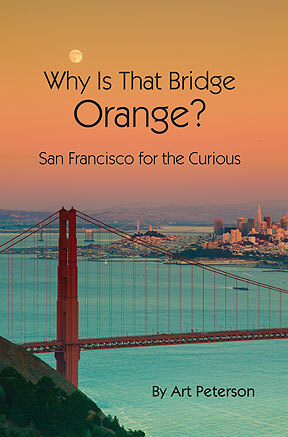 Excerpted with permission from Art Peterson's book, "Why Is That Bridge Painted Orange?" published in 2013, by Inquiring Minds Productions.